Music can bring close people from different parts of the world and that’s the beauty of it. In the rock/metal scene we have witnessed many projects of musicians from different countries and some of them offered us really good works. WONDERWORLD are such a band as well. The band started when, in March 2013, Ken Ingwersen (guitar) and Tom Fossheim (drums) who already played for 6 – 8 years for Ken Hensley (en Hensley & Live Fire) met Roberto Tiranti (vocals and bass). Soon these musicians realized that they had a working chemistry between them and decided to form WONDERWORLD. In 2014 they released their debut album and this one is their sophomore release (also they mention in their site that have finished material for the next release that will come in 2017). It is obvious that WONDERWORLD is a band that includes very experienced musicians who have offered quality works in their career. So the expectations are really high for this album. The band musically moves on the melodic rock sound as it was played in the 70’s and they also have many blues references on it. The compositions give you the sense that they come back from that era and that you already know them and this is a bit of a success for the band since they manage to recreate a sound from the past. This doesn’t mean they are clones, on the contrary the musicians behind the band use their influences in order to craft their own sound. They also have a clear and dynamic sound production that allows the listener to enjoy this release in every detail. 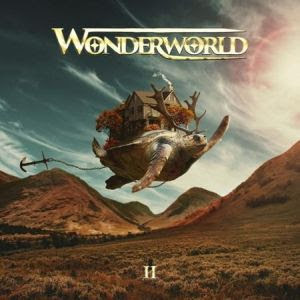 WONDERWORLD managed to revive the 70’s rock sound and give an album that is nostalgic and yet fresh with good performances and beautiful ideas. I think that they deserve your attention. Αναρτήθηκε από Nick Parastatidis στις 6:52 π.μ.